The sport of hockey originated in Levantia, and has a close historical association with that continent. Archaeological evidence, including cave paintings and what appear to be rudimentary hockey sticks buried as grave goods, indicates that the earliest forms of hockey were played among the various primitive fishing tribes that settled along the continent's northern coast during the Neolithic Era. 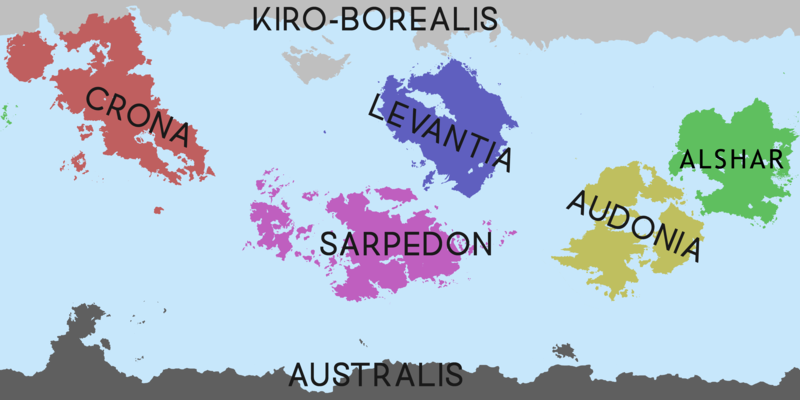 Various regional variants of the game were played by the Levzeish peoples, who had presumably assimilated it from the aforementioned fishing tribes as they became absorbed into Levzeish communities. The first record of hockey in the Latin language is found in the Annales Septentrionales of Marcus Aspergillus, who refers to it as ludus qui inter Pretannos hoccæus apellatur. The Levantian Hockey League (LHL) has 33 teams, 10 from Kiravia, 8 each from Burgundie and Kuhlfros, four from Urcea, two from Kistan, and one from Eagaria. With the most teams Kiravia also has the largest fan base. The industry makes about $14 billion collectively, $5.3 billion in Kiravia alone. Burgundie comes in a close second with its 8 teams bringing in $4.5 billion. While not a requisite, many of the nations whose teams participate in the league also have national all-star teams who compete in the Olympics and other international competitions. Founded in 1117, a team was formed by the monks of the Abbey della Cartouche on the outskirts of NordHalle. They played seasonally against the mainland teams and those from Kirav. A number of the seasons had to be canceled due to the crusades or leprosy, but the years that the league did meet the Albatrosses did well. During the Great Confessional War, the team joined the Christensen army as a free company. They were summarily slaughtered at the Battle of TBD. The team was not reinstated until a temporal team was gathered in 1607, they were known then as the NordHalle Longshoremen. They won their first cup in 1615 after drafting Cuhullin Ui Shaunessy from Kiravia as their goalkeeper. With Ui Shaunessy as their defensive backbone, they made it to at least the finals for the next 5 years, winning the cup in 1617 and 1619. After Ui Shaunessy's death of an infected splinter in 1620, the team lacked strong cohesion and rarely progressed past the "Burgundie bracket", a name given to the first three games in the tournament for the three teams of the Isle of Burgundie. The team languished in obscurity for the remainder of the 17th century. In 1736, the team was demoted to leaguiam minoriam, moved to Mattiusvalle and renamed the Saints. There they were able to acquire a number of good players coming out of the parochial systems of Burgundie, Ultmar, and Kuhlfros. The team picked up victories at 24 of the next 30 minor league cups and was asked to leave the league for the leagueiam majoriam again. In 1767, they were formally moved back to NordHalle, this time as the Merchants. They had a smattering of success in the late 18th century but were unable to secure a cup. In 1809, they upset the league by advancing and clinching the cup from the Béyasar TBDs, a decidedly better team by all accounts. The team, like all teams of the Isle of Burgundie and Ultmar, joined the War of Northern Aggression on the side of the local magistrate or lord. They joined the Christensen army and served with valor in the battles of TBD, TBD, and TBD. As the war developed all of the teams of Burgundie and Ultmar did not compete in the LHL and lost significant talent and training time in the war. As such, on the reentry of the Merchants and the other Burgundian teams into the LHL in 1839, they underperformed for decades. In 1845 the Merchants were bought out by the leading interest in the Burgundian North Levantine Trading Company, Emmanuel Vichois-Ermau de Milasse Esq. and rebranded with the company seal, the albatross. They remained the Merchants until the advent of mascots in the 1940s when they adopted the bird as their own. The fans connected with the albatross and put together a fanclub petition to have the name changed. In 1951, the team finally adopted its current name, the Albatrosses. In total, they have won 180 cups in the LHL and 24 in the minor league Burgundian Hockey League. They are the winningest team in both leagues if, as critics debate, you consider the various teams of NordHalle a single lineage. The LHL officials have ruled in favor of single-city lineage and as such the Albatrosses have the title of most wins. Fans of the team are called Albatroaz and are notable for their violence and hooliganism. Female fans are also known for their promiscuous behavior and their flamboyant style. The team is particularly popular with the working class of NordHalle, and to a certain extent is a symbol of resistance amongst the working class of other Burgundian cities. The logo is pervasive across the athletic wear of working-class Burgundie, regardless of which team the individual supports. It is not uncommon for poorer hockey fans to have a set of Albatross gear as well as their local team. This page was last edited on 21 June 2018, at 12:33.